Private Pool Parties available on Saturdays or Sundays from 6-8pm. Call the Manager at 712-873-5300. Memorial Park has undergone some big improvements this summer – Ryan Fouts raised $40,000 to purchase Miracle Playground Equipment and 60 volunteers came together to assemble and install on August 13, 2011. The City guys have been working hard to renovate the shelter house with new doors and windows, along with handicap accessible bathrooms, new paint was applied inside and outside along with new counters and sinks. Concrete has been poured and a covered patio will be erected on the west side to allow for more seating. This building is available to rent from April – October by contacting City Hall. The Maxwell Family donated land to the city in hopes that a park could be created. 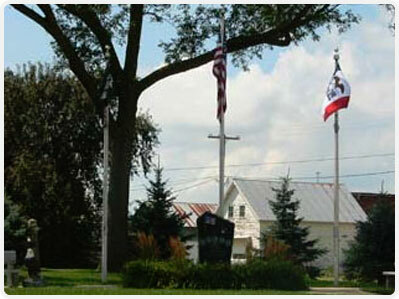 The City cleared away a run down house and Local Veterans purchased a beautiful monument to be placed at the center of the park. City crew worked with the local Veterans to build sidewalks and make this dream happen. Thanks to all who contributed!! and pour the sidewalks that wind though the park. The park is finished, the grass has come up, the flags have been raised and the bench has arrived. The bench was donated by Jim & Sally Bleil in memory of Sally's father. The first phase was completed in 2004. The path begins on Howard Dr. and runs parallel with Humbolt Ave., curves northward along the Meadows Golf course and loops thru Arlington Cemetery. Moville Youth Recreation Association a.k.a. MYRA is made up of local parents who have been instrumental to the youth athletic programs in Moville. This group has written and received $75,000 in grant money to improve the baseball and softball fields located on the NW edge of Moville. 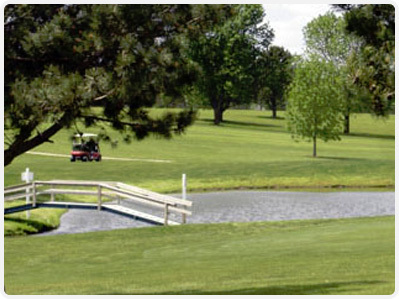 A beautiful nine hole golf course located on the east edge of Moville. The new Hitting Zone at The Meadows Country Club is open and ready for a work-out. 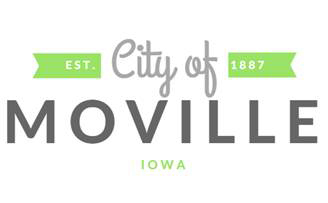 The Hitting Zone is Moville’s first indoor golfing/batting/pitching/fielding structure. The joint venture of the Wildcat Athletic Club and The Meadows involved taking an existing golf cart shed and turning it into an indoor hitting area with three golf stations, two batting cages and three pitching lanes. The heated Hitting Zone, located in the largest shed south of the parking lot, features FieldTurf as its playing surface. Members may sharpen their golf skills throughout the cold-weather months, as young baseball and softball players do the same. The Hitting Zone not only gives the community another asset to promote our fitness and well-being while bringing residents together in a fun environment, it offers Iowa’s 9-Hole Golf Course of the Year an added attraction to help grow its membership roster. For information about the Hitting Zone, contact Lance Glade at (712) 873-3184.